If Pain was able to resurrect Kakashi along with the other dead Konohagakure villagers, why did Hagoromo not reincarnate dead shinobis after the Fourth Great Ninja War? To expand on @Ōtsutsuki's comment, Hagoromo Ōtsutsuki did not manifest himself physically to Naruto since he is alread dead. 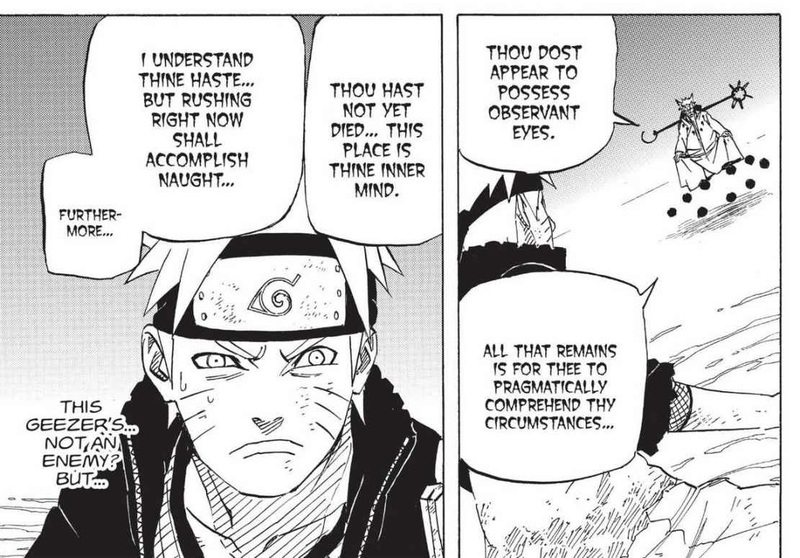 The scene where they were talking happened in Naruto's mind (Chapter 670). How he was able to share his powers with Naruto and Sasuke if he's already dead was never elaborated on in the manga, as far as I know. The Gedo Art of Rinne Rebirth requires the user's life in exchange for another's. Hagoromo is already dead, and he only manifested himself in Naruto's mind. It's quite hard to classify someone in this state as 'alive'. With this, we can say that you cannot offer your life for someone else's if you have already lost it in the first place. Why isn't Baki of the Sand fighting in the Fourth Great Shinobi War? In the fight between Jiraiya and Pain, why didn't Fukasaku and Shima's sound genjutsu affect Nagato? Did Kishimoto kill Itachi because he was too strong to fight in the Fourth Great Ninja War? Why didn't Kabuto resurrect Jiraiya during the Great War? Why can't Might Guy get his legs back? Why didn't Naruto retain the Gudo dama? Why doesn't Pain have some spare dead Bodies?